Aahh – the soap opera! Women (and, yes, even quite a few men) have enjoyed watching daytime soap operas for generations. When I was a little girl, my grandmother religiously watched what she called “my stories” every day. As she went about her daily activities of cleaning, cooking, sewing, etc., she would arrange to complete certain duties that could be done while sitting and watching the TV during the time slots that her stories were on. I’m not sure, but I think she watched As the World Turns and The Guiding Light – but my memory might be wrong on that point. If we were with her during the daytime, she would tell us to “play quietly, now, so I can hear my stories”. Quite often, I would sit and watch them with her and help her do whatever it was she would save to do at that time. Of course, there were no VCRs, DVDs, or DVRs, so if she didn’t arrange her day to be able to watch them live, she’d miss them and that was not something she would be happy about! They were her guilty pleasure and she made sure she didn’t miss them often! I don’t know if it was because of those early days of watching Grandma’s stories with her or if it was just inevitable because of the era I grew up in, but I, too, found myself indulging in the guilty pleasure that soap operas became. The first soaps I got hooked on were General Hospital and Dark Shadows. They were both on after school, so I would rush home to watch them while I started my homework. I watched Dark Shadows, the hokey saga of vampires and ghosts that aired long before either were “cool”, the entire time it was on the air (1966 – 1971) – I rarely missed an episode. My favorite characters were Quentin and the lovely Angelique. A trivia tidbit: Kate Jackson, of the original Charlie’s Angels, got her start on Dark Shadows. Once I got into my high school years, though, I had much better things to do than rush home to watch a soap opera. I stopped watching General Hospital and never looked back. After I graduated from high school in 1974, I went to work at GE and got an apartment in Brockport with my friend Greta. Greta and I both worked second shift and she got me hooked on three soaps – Ryan’s Hope, All My Children, and One Life To Live. Like my grandmother, we scheduled our days so that we could be sure to be home in time to watch them. We’d get up about 10:00-ish or so, do any errands or chores we had that day, come home in time to watch RH at 12:30, AMC at 1:00, and OLTL at 2:00. We’d get ready for work during the commercials and head out the door as soon as OLTL ended at 3:00 – just in time to get to work and clock in by our 3:30 start time. Ryan’s Hope was a really good soap and I was so sad when it didn’t last very long – I watched it just about the entire 13 or so years it was on. My allegiance to OLTL, though, was spotty – I could take it or leave it. There were periods where the story line kept me interested, but I easily broke away from it. The soap that I was interested in the longest was All My Children. I started watching it in the mid-70s (4-5 years after it started) and watched it off and on (mostly on) for much of the next close to 40 years. I got Mom hooked, too! hehehe Yes, there were times when my work schedule changed and I couldn’t watch it for a while, but it wasn’t long before VCRs were available so I could tape it and watch it later in the evening. I tried to force myself to not tape them while I was working on my degrees (no time for that sort of thing working full-time and going to school full-time), but I’d just nicely get used to not seeing it and I’d go home to visit Mom and she’d get me interested, again. I haven’t watched it much for the past couple of years, now, but when I heard it was going off the air I had to start taping it, again — I had to catch the ending! I kept up with the characters, even when I wasn’t watching it regularly, and made sure to follow certain story lines. And, as with most soaps, I was always able to pick them right back up and get right back into the story lines – no matter how long I hadn’t been watching them – sometimes with a little help from other fans to fill in the blanks or to explain that a new face wasn’t really a new character – just a new actor playing the old character! I matured with Erica Kane and Brooke English. I had wild crushes on Tom Cudahy, Cliff Warner, and Chuck Tyler, but also, along with thousands of other girls, found myself shamelessly attracted to Tad (the Cad) Martin – the bad boy of Pine Valley! I rejoiced in their weddings and the birth of their babies. I was respectfully shocked at the exciting plot twists and turns. I hated the villains and loved the heroes. I really got into taking sides over the rivalries – like Erica and Brooke, Mona and Phoebe, Palmer and Adam, Greenley and Kendall, and others. I swooned over the eternal love stories, like Jenny and Greg, Tad and Dixie, Palmer and Daisy, Ryan and Greenley, Kendall and Zack, Erica and Jack, and others. I sobbed in utter hysteria over their deaths and funerals……..and, then, was so very happy to find that they actually were just lost somewhere with amnesia and found their way back to Pine Valley, alive and well – sometimes after having plastic surgery to give them a new face! Yes, I was wrapped up in the characters and their lives – totally! 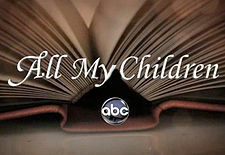 So, now, as of yesterday – Friday, September 23, 2011 – after 41 years, All My Children has been canceled and will no longer air on ABC Television! A cooking themed talk show will begin airing in the 1:00 daily time slot beginning this coming Monday. I so enjoyed the last few weeks of episodes where they brought back old characters and reunited families and flashed back to how it all began! I even liked the bazaar story line of David Hayward and his special medical procedure that made him able to bring several recently (within the past couple of years) deceased characters back to life and back to Pine Valley! It has been an emotional few weeks. So, will fans ever find out the answer to the three burning questions the show left hanging? Are Erica and Jack really finished or will they get back together (again) and prove that true love conquers all? Who is the last patient David Hayward claims to have brought back to life and has stashed somewhere waiting to be revealed and returned to Pine Valley? Who did JR shoot from the secret passageway in Chandler Mansion at Stuart’s welcome home party and are they dead or will David save them? ← What I’m looking forward to…..and what I’ll miss…..